Dr Joseph Cheer, lecturer in the Graduate Tourism Program was recently celebrated as one the top 50 ‘awesome’ scholars in tourism, an initiative of Women Academics in Tourism (WAiT) led by Catheryn Khoo-Lattimore, Elaine Yang, Ryan Yung and Rachel Perkins (Griffith University). WAiT aims to help women academics share career information specific to tourism and its sub-disciplines, and make contacts across the various tourism departments and schools around the world. WAiT raises and promotes awareness on the growing literature that points to occupational sexism, where women generally lose out on leadership positions based on normative perception of women's role in society. The list, made up of scholars from early to mid and senior career academics from around the world including many prominent scholars in tourism research, canvassed nominations from scholars globally and was adjudicated by a global group of judges who considered how scholars reinforced the humanness in their work. Most of Dr Cheer’s recent research draws on tourism in developing countries and he has supervised graduate research projects of students from Asia Pacific, Latin America and Africa. Dr Cheer is currently undertaking research that links modern slavery and orphanage tourism in South East Asia. 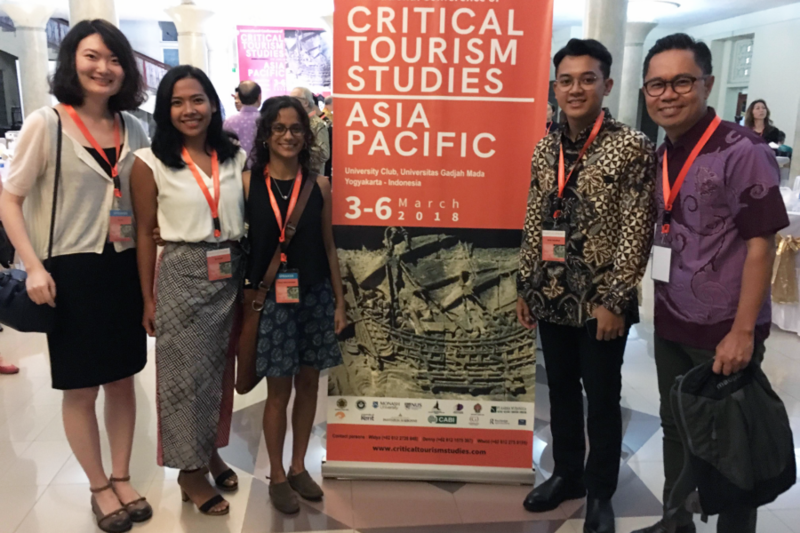 Dr Cheer invited five students to attend the Critical Tourism Studies Asia Pacific conference in Indonesia recently as a way of immersing them in cutting edge research – two of them (Bo Ma and Divya Saharabuddhe) presented papers to a global audience of scholars. In the photo from top left is Kevin Aninditya (Indonesia), Divya Sahasrabuddhe (India), Joseph Cheer (Monash). 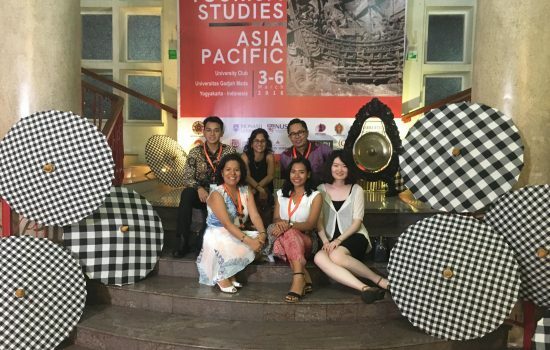 At the bottom row: Sandra Cherro Osorro (Monash University/Peru), Sri Utama (Indonesia) and Bo Ma (China). “If you go on a holiday and lie on a beach in Bali and you have cheap accommodation and cheap meals and can buy cheap souvenirs, the very fact that you can do that means that someone, somewhere is working under very trying conditions,” he said. “Someone, somewhere is getting paid less than they should and we all have a responsibility as consumers to ensure that what we do as global citizens doesn’t come about because someone else is suffering. Very often this is a gendered issue with women and girls bearing most of the brunt”. His book, Modern Day Slavery and Orphanage Tourism, is due for publication with CABI in March 2019, and includes a chapter from his former student and Monash alumni, Shivani Kanodia who hails from India – Shivani’s chapter draws from her Masters thesis at Monash which Joseph supervised. He says it would be easy and convenient to go to established academics and ask if they’d be interested in contributing but Dr Cheer asks if that is necessarily developing the next generation and whether academics are encouraging new voices to join the conversation. He acknowledges it’s a challenging thing to do in the academy, especially when, he says, there is a push for greater efficiencies, where academics are under pressure to publish. “To a large degree it’s about giving [students] a voice, especially women, and nurturing them, as well as acknowledging the work they are interested in, rather than pigeonholing everybody into doing standard things,” Dr Cheer said. He says students underestimate their capabilities, and they need a great deal of encouragement, mentorship and ‘pastoral care’. As student numbers in universities rise the amount of pastoral care that can be provided must be maintained. “It’s easy for students to get lost in all of that. I find that international students tend to get lost and see themselves as a number rather than someone who might have great ideas that can contribute to knowledge development,” Dr Cheer said. Dr Cheer also says he encourages his international students to undertake independent research, as often international students, due to English language capacities and the extent to which they can write in English, are disadvantaged from considering independent research. “Very often they’re channeled into coursework, whereas I think at times international students have a great deal to offer in research terms,” he said.